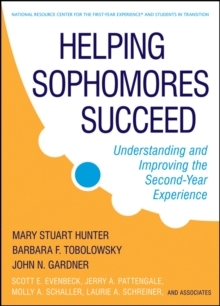 Helping Sophomores Succeed offers an in-depth, comprehensive understanding of the common challenges that arise in a student's second year of college. Sponsored by the University of South Carolina's National Resource Center for The First-Year Experience(R) and Students in Transition, this groundbreaking book offers an examination of second-year student success and satisfaction using both quantitative and qualitative measures from national research findings. Helping Sophomores Succeed serves as a foundation for designing programs and services for the second-year student population that will help to promote retention, academic and career development, and personal transition and growth. Praise for Helping Sophomores Succeed"Lost, lonely, stressed, pressured, unsupported, frequently indecisive, and invisible, many sophomores fall off the radar of campus educators at a time when they may most be seeking purpose, meaning, direction, intellectual challenge, and intellectual capacity building. The fine scholars who focused educators on the first-year and senior transitions have done it again a magnificent book to focus on the sophomore year!" Susan R. Komives, College Student Personnel Program, University of Maryland"For years, student-centered institutions have front-loaded resources to promote student success in the first college year. 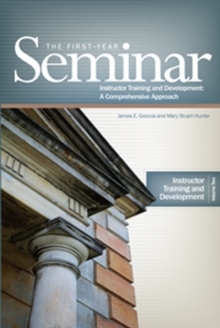 This volume is rich with instructive ideas for how to sustain this important work in the second year of college." George D.
Kuh, Chancellor's Professor and director, Indiana University Center for Postsecondary Research"A pioneering work, this brilliant text explores in practical and meaningful ways the all but neglected sophomore-year experience, when students face critical choices about their major, their profession, their life purpose." Betty L.
Siegel, president emeritus, Kennesaw State University? "All members of the campus community faculty, student affairs educators, staff, and students will benefit from learning about the unique challenges of the second college year. The book provides research and best practices to help educators and students craft an integrated, comprehensive approach to helping second-year students succeed." Marcia Baxter Magolda, distinguished professor, Educational Leadership, Miami UniversityThe National Resource Center for The First-Year Experience(R) and Students in Transition supports and advances efforts to improve student learning and transitions into and through higher education by providing opportunities for the exchange of practical, theory-based information and ideas.